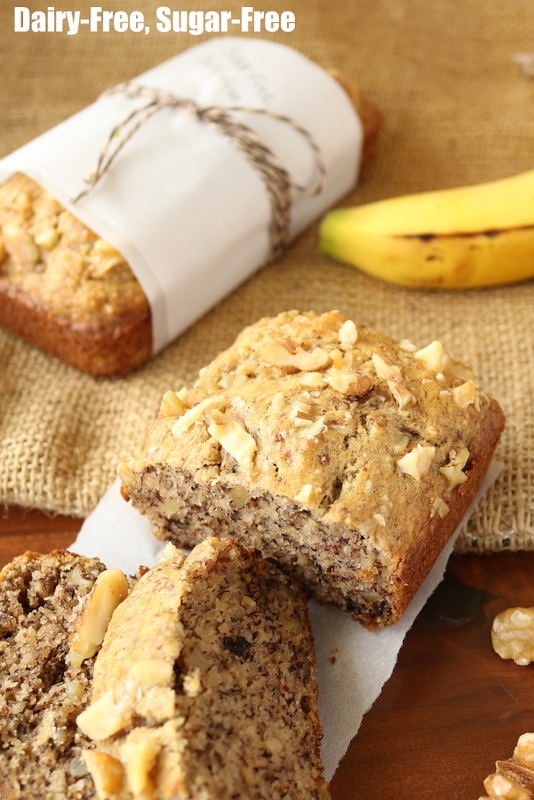 This guilt-free Healthy Banana Nut Bread is packed with all the great flavor of a traditional banana nut bread without dairy or sugar added. 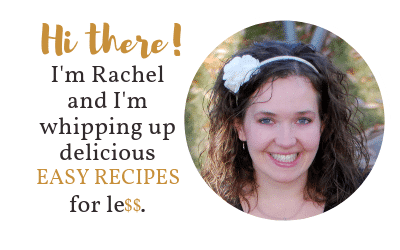 Whether you are on a low-carb, low-sugar diet, have a dairy allergy or just because you’re trying to be a little more healthy, this healthy banana nut bread will not disappoint! 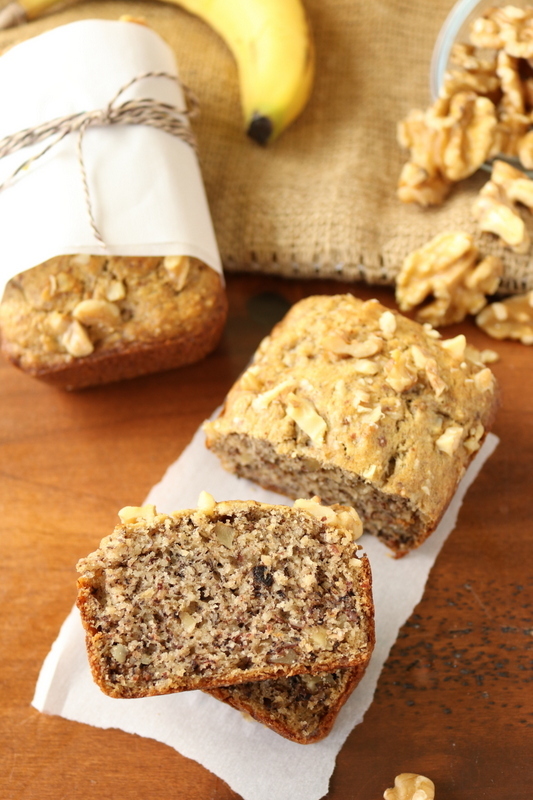 Healthy Banana Nut Bread That Tastes Good! It can be hard to eat healthy, whether it’s because of a medical issue or personal choice. This low-carb moist healthy banana bread may not “save the day” but it will sure help. If you have to watch those carbs because of diabetes or a new low-carb diet OR if you are lactose intolerant and have to go dairy free… this bread is for you! 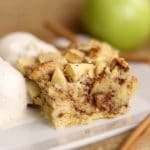 It’s moist, delicious and has everything a traditional banana nut bread has to offer, only way healthier. I grew up with a mom and grandma that made banana bread any time we had over-ripe bananas. (It seems that was more often than not. LOL) I LOVE my grandma’s recipe but it’s not what I’d consider “healthy.” It had loads of sugar, butter, flour and was baked in a pan coated in cinnamon sugar. 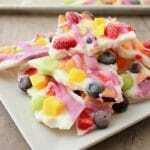 Like a said, yummy but ready to put anyone into a sugar coma. Recently, I made the decision to get a little healthier. I started walking more and watching my calories. 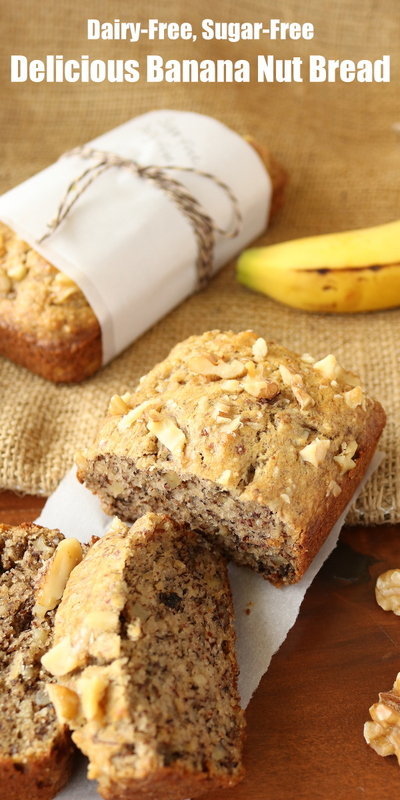 Did you know traditional banana bread has over 300 calories per serving?! WOW! I was on a mission to still get me delicious banana nut bread without breaking the calorie bank. I started experimenting with sugar alternatives like honey and zero calorie sweetener sugar substitutes. After making several batches of bread I finally found the perfect combination to keep all the goodness and ditch the sugar, dairy, and calories. I know it’s not a truly sugar-free banana nut bread because it still has bananas in it but it is a no-sugar-added banana bread. Bananas have a lot of natural sugar but I’ve always taken the view that natural sugars founded in whole foods aren’t as bad as refined sugars. This bread is moist, rich and very filling. 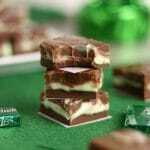 This recipe makes about 16 servings. I like to make this recipe in 4 mini loaves and freeze a couple for later. A serving is a 1/4 of a mini loaf and has about 150 calories. If you are looking to lower the calories you could save yourself about 25-30 calories per serving by omitting the walnuts from the recipe. 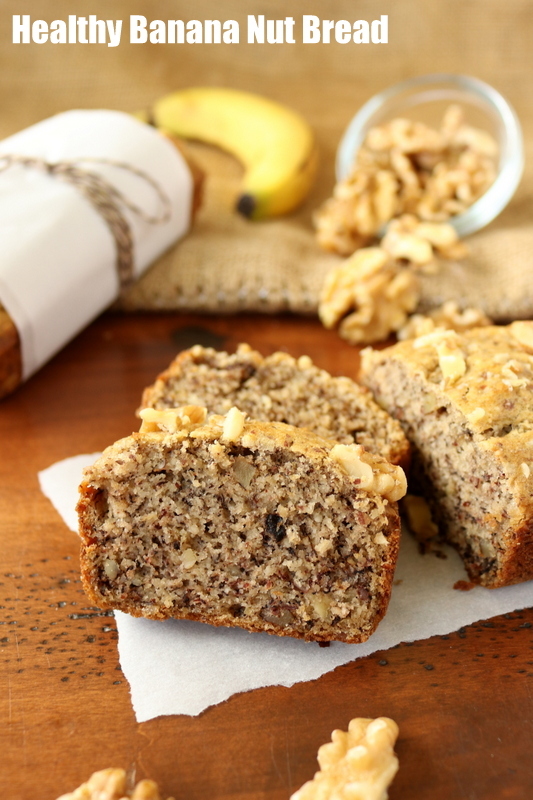 This bread is also just as easy to make as your traditional banana nut bread but offers so much more in the “healthy department.” All in all, if you are looking for a really good, moist, delicious HEALTHY banana nut bread, this recipe is for you! It’s so good even the non-healthy goers will enjoy it. 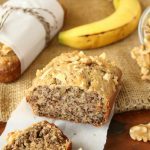 This guilt-free Healthy Banana Nut Bread is packed with all the great flavor of a traditional banana nut bread without dairy or sugar added. Cream coconut oil, and sweetener together. Add eggs and vanilla. Add bananas, beat until bananas are mashed into very small pieces (or premash before mixing them in). Add all dry ingredients. Mix only until dry ingredients are incorporated. Fold in walnuts (reserve 1/4 to 1/2 cup to sprinkle on top of loaves). 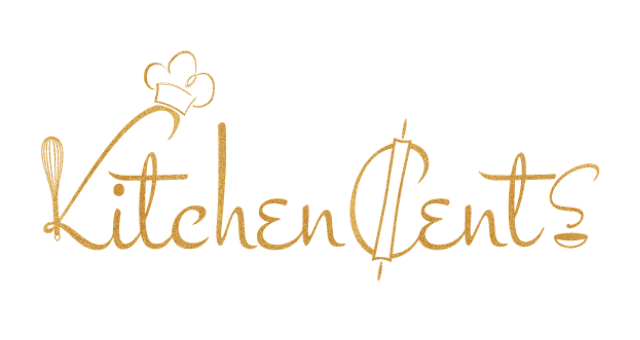 Line 4 mini loave pans with parchment paper or spray with non-stick spray. Pour 1 to 1 1/4 cups batter into each pan. Sprinkle remaining nuts on top of loaves. Bake at 350 degrees F. for 30-35 minutes or until toothpick comes out clean. You can also use a 1 large loaf pan. Make sure to adjust bake time accordingly. A large loaf can take 60-70 minutes to bake depending on the pan and oven.